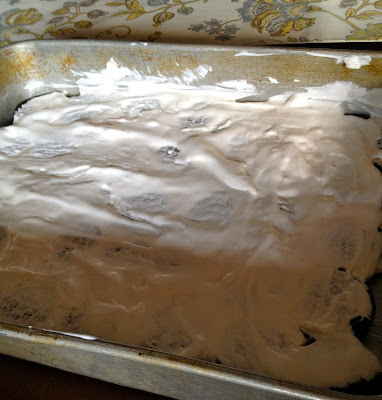 Since our kitchen is still mostly unfunctional, I was hunting on pinterest for a dessert I could make without a stove. 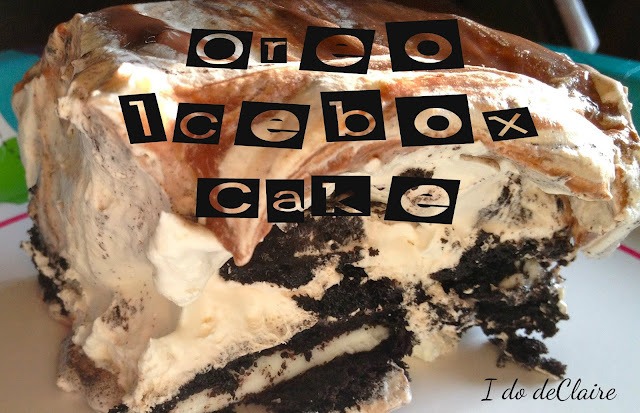 This one seemed to be pretty popular, no stove required, AND it had oreos. Double stuff. Done! It was so fast and easy to make. The original recipe can be found here. 1. You will need milk (about 1 1/2c. 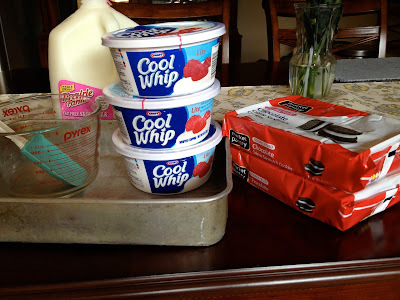 ), chocolate syrup or ice cream fudge topping, 3 tubs of cool whip, and 4 packages of double stuff oreos (or 3 packages of regular). 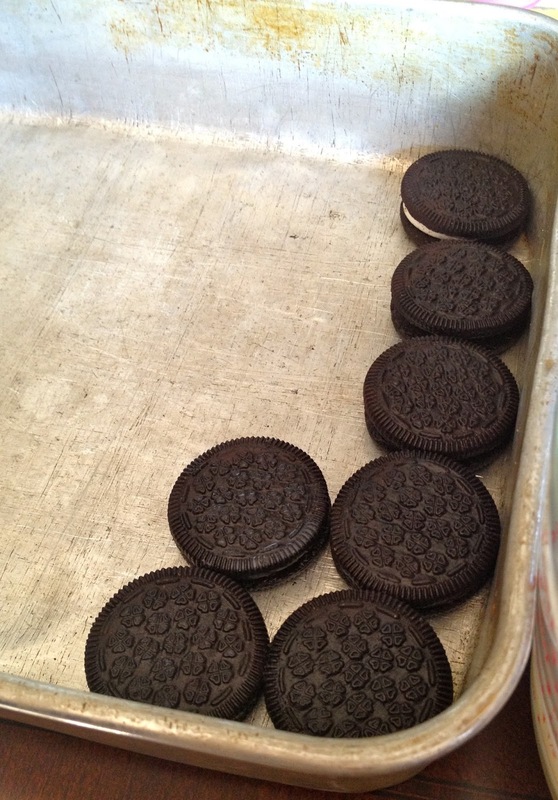 Basically you need 105 oreos. The original recipe called for 90, but I fit 35 for each layer. Not sure why, all 9x13 pans should theoretically be the same size, right?? 2. Dip each oreo in milk and line 9x13 pan. They don't have to get soggy. 3. 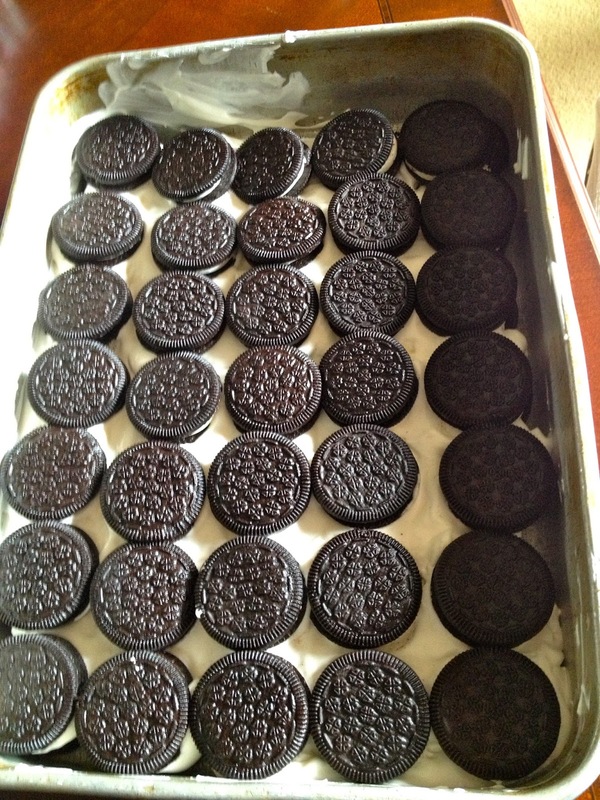 Once you have a layer of oreos, spread a tub of cool whip. 4. Repeat the process. Then repeat it again. There should be 3 layer of oreos and 3 layers of cool whip. 5. 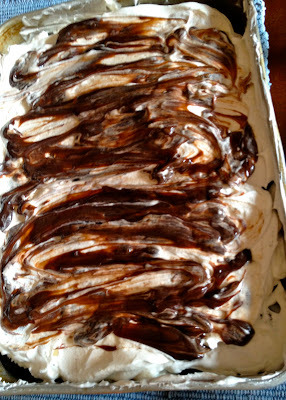 Drizzle chocolate syrup over top. We had about a half jar of chocolate fudge ice cream topping, so I just melted it in the microwave and used that. Then I spread it around so it wouldn't look so gloppy. End result wasn't pretty, but that isn't the important thing, is it? It was GOOD. I would recommend refrigerating overnight. The oreos get a little softer and it makes a big difference. I actually didn't like it the night of, but the next day it was much better. It is also easier to get out of the pan the next day. 1. Dip oreos in milk then line bottom of 9x13 pan. Spread cool whip over top. 2. Repeat two more times so there are 3 total layers of oreos and cool whip. 3. Top with chocolate syrup or melted chocolate fudge topping. 4. Refrigerate overnight. Serve cold. It was very sweet! 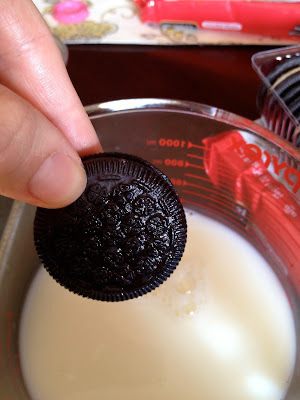 Small pieces and a glass of milk are recommended, but we LOVE oreos!